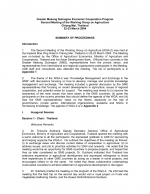 The Second Meeting of the Working Group on Agriculture (WGA-2) was held at the Imperial Mae Ping Hotel in Chiang Mai, Thailand on 22-23 March 2004. The Meeting was co-hosted by the Office of Agricultural Economics, Ministry of Agriculture and Cooperatives, Thailand and the Asian Development Bank. Officials from countries in the Greater Mekong Subregion (GMS), representatives from the private sector, and representatives from international and regional organizations participated in the Meeting. ADB staff and consultants also attended the meeting.